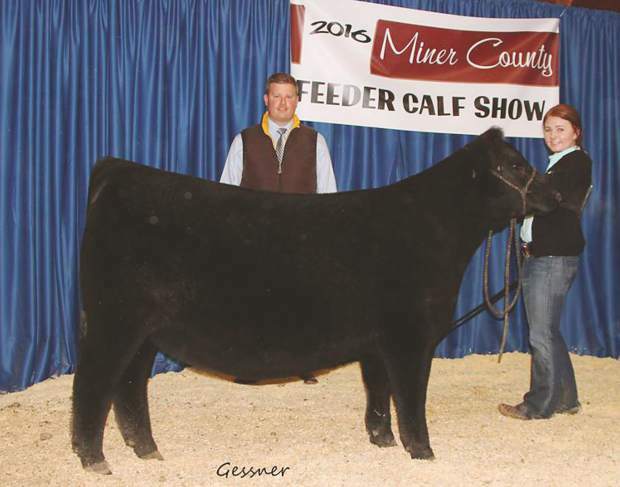 Champion Breeding Heifer was awarded to Lizzy Black, Brookings who was among a record number of open class and 4-H participants who turned out for the Miner County 35th Annual Feeder Calf Show. A record number of open class and 4-H entries turned out for the Miner County 35th Annual Feeder Calf Show. 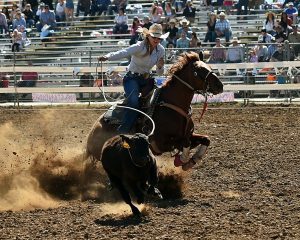 There was a total of 166 entries showed by exhibitors who represented counties across South Dakota as well as the states of Nebraska, Minnesota and Iowa. The event was held November 25, 2016. Judge Ryan Habeger of Burke, Iowa evaluated calves, named the top-five individual steers and heifers, 4-H Champions and evaluated the Pen-of-Three event. Champion British Heifer was awarded to Hanna Peterson, Fedora and Reserve British Heifer was awarded to CJ Calmus, Canova. Class 1: first place, Hanna Peterson, Fedora; second place, CJ Calmus, Canova; third place, Katlin Schlim, Carthage; fourth place, Logan Schlim, Carthage and fifth place, Carter Klinkhammer, Howard. Class 2: first place, Ben Connor, Winfred; second place, Hanna Peterson, Fedora; third place, Lane Miller, Winfred and fourth place, Logan Schlim, Carthage. Champion Exotic Heifer was awarded to Riley Genzlinger, Canova and Reserve Exotic Heifer was awarded to Carter Klinkhammer, Howard. Class 3: first place, Riley Genzlinger, Canova; second place, Carter Klinkhammer, Howard; third place, Carter Klinkhammer, Howard; fourth place, Tate Miller, Winfred and fifth place, Ben Connor, Winfred. Champion Market Heifer was awarded to Cody Eich, Howard and Reserve Champion Market Heifer was awarded to Melanie Calmus, Canova. Class 4: first place, Cody Eich, Howard; second place, Tanner Calmus, Canova; third place, Melanie Calmus, Canova and fourth place, Carter Klinkhammer, Howard. Champion British Steer was awarded to Tate Miller, Winfred and Reserve British Steer was awarded to Lane Miller, Winfred. Class 5: first place, Tate Miller, Winfred; second place, Lane Miller, Winfred; third place, Kieffer Klinkhammer, Howard; fourth place, Logan Schlim, Carthage; fifth place, Mason Jacobson, Howard; sixth place, Katlin Schlim, Carthage and seventh place, Zach Jacobson, Howard. Champion Exotic was awarded to Tate Miller, Winfred and Reserve Exotic was awarded to, Lane Miller, Winfred. Class 6: first place, Tate Miller, Winfred; second place, Lane Miller, Winfred; third place, Melanie Calmus, Canova and fourth place, Zach Connor, Winfred. Class 7: first place, Lane Miller, Winfred; second place, Carter Klinkhammer, Howard; third place, Riley Genzlinger, Canova; fourth place, Kieffer Klinkhammer, Howard and fifth place, Tanner Calmus, Canova. Class 8: first place, Tate Miller, Winfred; second place, Lane Miller, Winfred; third place, Carter Klinkhammer, Howard and fourth place, Zach Connor, Winfred. Overall 4-H Market Champion was awarded to Tate Miller, Winfred and overall 4-H Reserve Market Beef was awarded to Cody Eich, Howard. Champion Breeding Hereford was awarded to Sydney Johnson, Wessington Springs and Reserve Champion Breeding Hereford was awarded to Will Freking, Alpha, Minnesota. Angus Breeding Heifers: first place, Lizzy Black, Brookings; second place, Tyler Bush, Britton; third place, Samantha Podzimek, Mitchell; fourth place, Riley Johnson, Jackson, Minnesota; fifth place, Rachel Derksen, Huron; sixth place, Logan Zemlicka, Wessington; seventh place, Aaron Linke, Woonsocket; eighth place, Jonathan Linke, Woonsocket and ninth place, Charli Rawden, Mina. Red Angus Breeding Heifers: first place, Brooklyn Ludens, Hurley. Hereford Breeding Heifers: first place, Will Freking, Alpha, Minnesota; second place, Addison Wall, Pleasantville, Iowa; third place, Brooke Skoglund, Hecla; fourth place, Abby Siemonsma, Garretson; fifth place, Blake Peskey, Iroquois; sixth place, Austin Rawden, Mina; seventh place, Kyla Peskey, Iroquois; eighth place, Hanna Peterson, Fedora; ninth place, Katlin Schlim, Carthage; tenth place, Blake Peskey, Iroquois; eleventh place, Logan Schlim, Carthage. Hereford Breeding Heifers: first place, Will Freking, Alpha, Minnesota; second place, JC Forman, Ree Heights; third place, Hanna Peterson, Fedora; fourth place, Carter Calmus, Canova; fifth place, Brooke Johnson, Bruce; sixth place, Ben Connor, Winfred and seventh place, Will Freking, Alpha, Minnesota. Hereford Breeding Heifers: first place, Sydney Johnsen, Wessington Springs; second place, Chesney Effling, Highmore; third place, Chesney Effling, Highmore; fourth place, Will Freking, Alpha, Minnesota and fifth place, Kyla Peskey, Iroquois. Shorthorn Breeding Heifers: first place Savannah Vogel, Hamill; second place, Micah Leonard, Armour; third place, Savannah Vogel, Hamill and fourth place, Shay Michalski, Willow Lake. Shorthorn Plus Breeding Heifers: first place, Cash Voegele, Lennox; second place, Taylor Sinkie, Gann Valley; third place, Kailey Koep, Lakefield, Minnesota; fourth place, Dylan Knoll, Platte; fifth place, Emma Noteboom, Burbank; sixth place, Molly Myers, Canton and seventh place, Austin Rawden, Mina. Simmental Breeding Heifers: first place, Cagney Effling, Highmore; second place, Sydney Johnsen, Wessington Springs; third place, Talli Heim, Wessington Springs; fourth place, Shannon Duxbury, Wessington and fifth place, Abby Blagg, Salem. Maine Anjou Breeding Heifers: first place, Jake Knudson, Estherville, Iowa; second place, Cutler Michalski, Willow Lake and third place, Kasey Michalski, Willow Lake. MaineTainer Breeding Heifers: first place, Cash Voegele, Lennox; second place, Nicolette Schmidt, Willow Lake; third place, Storm Johnsen, Wessington Springs; fourth place, Riley Larson, Wessington Springs; fifth place, Kaitlyn Micheel, Cavour and sixth place, Trey Struck, Humboldt. MaineTainer Breeding Heifer: first place, Greyson Nielson, Arlington; second place, Trevor Bergh, Florence; third place, Jake Knudson, Estherville, Iowa; fourth place, Allyson Beninga, Sioux Falls; fifth place, Garrett Mertens, Milbank; sixth place, Jamin Leonard, Armour and seventh place, Bailey DeJong, Kennebec. Champion MaineTainer was awarded to Greyson Nielsen, Arlington and Reserve MaineTainer was awarded to Trevor Bergh, Florence. Chianina Breeding Heifers: first place, Hillary Albrecht, Howard; second place, Brooke Skoglund, Hecla; third place, Bayley Kroupa, Brookings; fourth place, Riley Johnson, Jackson, Minnesota; Riley Larson, Wessington Springs; sixth place, Jamin Leonard, Armour and seventh place, Dylan Knoll, Platte. Charolais Breeding Heifers: first place, Cagney Effling, Highmore. Charolais Composite Breeding Heifers: first place, Tate Bergh, Florence; second place, Storm Johnsen, Wessington Springs; third place, Taylor Sinkie, Gann Valley; fourth place, Emily Johnson, Bruce and fifth place, Maliya Mikkelson, Watertown. Commercial Breeding Heifers: first place, Lizzy Black, Brookings; second place, Hannah Heezen, Wessington Springs; third place, Ashlynne Beninga, Sioux Falls; fourth place, Lexi Stebral, Iowa City, Iowa; fifth place, Storm Johnsen, Wessington Springs; sixth place, Tucker Micheel, Cavour; seventh place, Taylor Sinkie, Gann Valley; eighth place, Avery Orth, Alpena; ninth place, Havana Mikkelson, Watertown and tenth place, Dalton Larson, Harford. Other Breeding Heifer: first place, Kerstynn Heim, Wessington Springs. Exotic Breeding Heifers: first place, Greyson Nielsen Arlington; second place, Cash Vogele, Lennox; third place, Cagney Effling, Highmore; fourth place, Hilary Albrecht, Howard; fifth place, Shannon Duxbury, Wessington. Overall Breeding Top 5 Breeding Heifers: first place, Lizzy Black, Brookings; second place, Tyler Bush, Britton; third place, Greyson Nielsen, Arlington; fourth place, Cash Vogele, Lennox and fifth place, Cagney Effling, Highmore. Market Heifers: first place, Logan Zemlicka, Wessington; second place, Trey Skoglund, Hecla; third place, Samantha Podzimek, Mitchell and fourth place, Carter Calmus, Canova. Market Heifers: first place, Jake Knudson, Estherville, Iowa; second place, Ty Bergh, Florence; third place, Cody Eich, Howard; fourth place, Bailey DeJong, Kennebec; fifth place, Taylor Sinkie, Gann Valley and sixth place, Dalton Larson, Hartford. Champion Market Heifer was awarded to Jake Knudson, Estherville, Iowa and Reserve Market Heifer was awarded to Ty Bergh, Florence. Angus Steers: first place, Kase Callies, Winfred. Red Angus Steers: first place, Raylee Fagerhaug, Wessington Springs and second place, Kasey Michalski, Willow Lake. Hereford Steers: first place, Will Freking, Alpha, Minnesota; second place, Lindsey Mertens, Milbank; third place, Logan Schlim, Carthage and fourth place, Cassidy Terwilliger, Winfred. Shorthorn Steers: first place, Shay Michalski, Willow Lake. Champion Overall British Market Animal was awarded to Will Freking, Alpha, Minnesota and Reserve British Market Animal was awarded to Lindsey Mertens, Milbank. Top 5 British Market Animal: first place, Will Freking, Alpha, Minnesota; second place, Lindsey Mertens, Milbank; third place, Raylee Fagerhaug, Wessington Springs; fourth place, Kase Callies, Winfred and fifth place, Shay Michalski, Willow Lake. Shorthorn Plus Steers: first place, Nick Kappenman, Madison; second place, Ryan Dolieslager, Doon, Iowa and third place, Tate Miller, Winfred. Simmental Steers: first place, Regan Derksen, Huron; second place, Mitchell Schmidt, Willow Lake; third place, Abbie Bratland, Bryant and fourth place, Sydney Johnsen, Wessington Springs. Maine Steers: first place, Aaron Suhr, Waukee, Iowa; second place, Bayley Kroupa, Brookings; third place, Tyson Jones, Genoa, Nebraska; fourth place, Cagney Effling, Highmore; fifth place, Brooke Skoglund, Hecla; sixth place, Jake Sievers, Wolsey and seventh place, Kaitlyn Micheel, Cavour. Maine Steers: first place, Harlee Heim, Wessington Springs; second place, Tanner Mertens, Milbank; third place, Allie Kappenman, Madison; fourth place, Bailey DeJong, Kennebec; fifth place, Lane Miller, Winfred; sixth place, Kylie Beare, Estelline. Champion Maine Steer was awarded to Harlee Heim, Wessington Springs and Reserve Maine Steer was awarded to Aaron Suhr, Waukee, Iowa. Chianina Steers: first place, Tyler Bush, Britton; second place, Trevor Bergh, Florence; third place, Talli Heim, Wessington Springs; fourth place, Ashlynne Beninga, Sioux Falls; fifth place, Makayla Nelson, Volga; sixth place, Trey Skoglund, Hecla and seventh place, Garrett Mertens, Milbank. Charolais Steers: first place, Aaron Suhr, Waukee, Iowa; second place, Payton M. Beare, Ree Heights; third place, Harlee Heim, Wessington Springs; fourth place, Trey Skoglund, Hecla; fifth place, Mitchell Schmidt, Willow Lake; sixth place, Lane Miller, Winfred; seventh place, Tyson Jones, Genoa, Nebraska and eighth place, Tucker Micheel, Cavour. Limousin Steers: first place, Geoff Dunkelberger, Chancellor; and second place, Cutler Michalski, Willow Lake. Commercial Steers: first place, Bayley Kroupa, Brookings; second place, Rachel Derksen, Huron; third place, Bailey DeJong, Kennebec; fourth place, Tate Miller, Winfred; fifth place, Jake Sievers, Wolsey and sixth place, Hannah Heezen, Wessington Springs. Commercial Steers: first place, Keaton Krieg, Adel, Iowa; second place, Greyson Nielson, Arlington; third place, Kylie Beare, Estelline; fourth place, Tate Bergh, Florence; fifth place, Talli Heim, Wessington Springs; sixth place, Brent Nelson, Volga; seventh place, Kerstynn Heim, Wessington Springs and eighth place, Trey Struck, Humboldt. Champion Crossbred was awarded to Keaton Krieg, Adel, Iowa and Reserve Crossbred was awarded to Bailey Kroupa, Brookings. Champion Exotic Market Animal was awarded to Aaron Suhr, Waukee, Iowa and Reserve Exotic Market Animal was awarded to Keaton Krieg, Adel, Iowa. Top 5 Exotic Market Animal: first place, Aaron Suhr, Waukee, Iowa; second place, Keaton Krieg, Adel, Iowa; third place, Tyler Bush, Britton; fourth place, Bailey Kroupa, Brookings and fifth place, Trevor Bergh, Florence. Champion Market Animal was awarded to Aaron Suhr, Waukee, Iowa and Reserve Market Animal was awarded to Keaton Krieg, Adel, Iowa. Top 5 Market Animals: first place, Aaron Suhr, Waukee, Iowa; second place, Keaton Krieg, Adel, Iowa; third place, Tyler Bush, Britton; fourth place, Bailey Kroupa, Brookings and fifth place, Jake Knudson, Estherville, Iowa.